It’s peak apple season here in the Pennsylvania and I happen to live with a 2 ½ year old overzealous apple picker. Recently I found myself to be the proud owner of a 20 lb box of freshly picked apples so I started looking for some great apple recipes to incorporate into our menu over the next few weeks. Besides the obvious apple crisps, crostatas and pies, I knew I wanted to try some savory recipes as well. 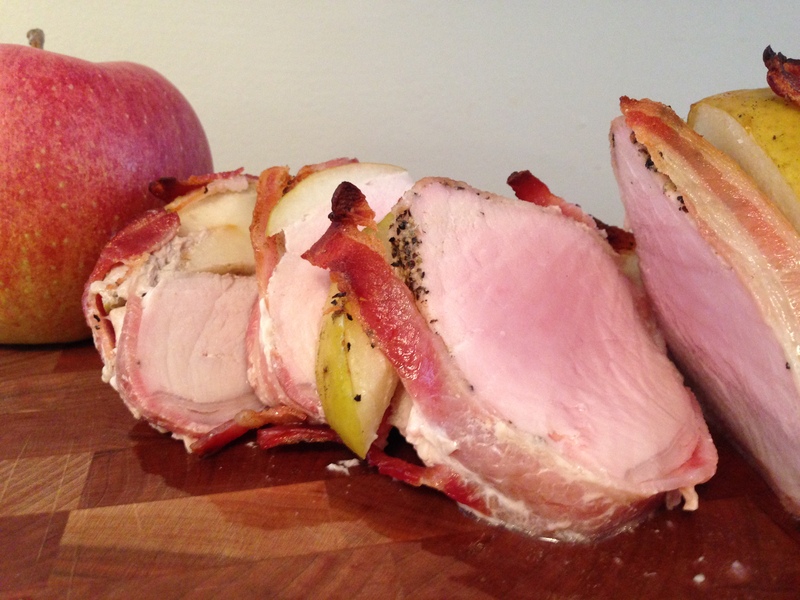 This dish is a combination of two recipes I’ve seen over and over again on Pinterest – bacon wrapped pork tenderloin and slow-cooker apple stuffed pork roast. They both sounded delicious to me but I only had one pork roast on-hand, so this was definitely the result of some experimentation. The finished dish was delicious and absolutely perfect for a Fall weeknight evening. 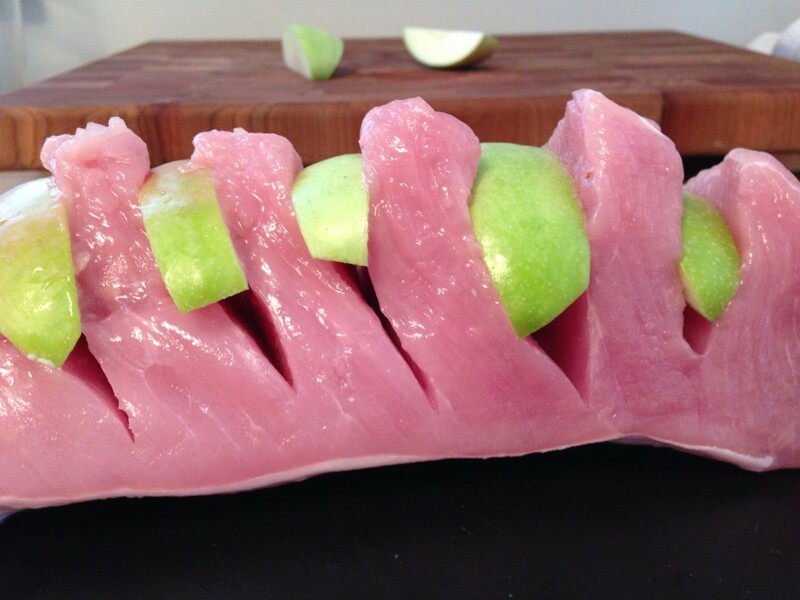 Slice the apple into 8-10 wedges, leaving the skin on. 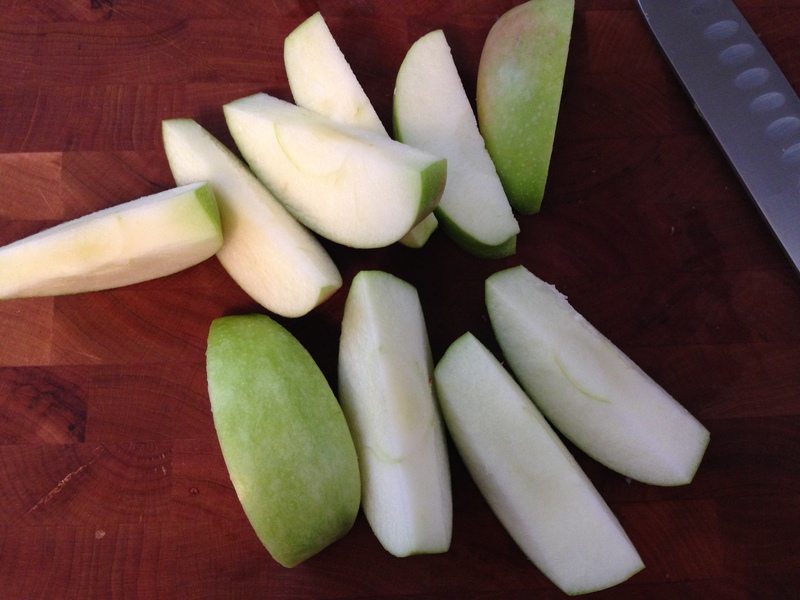 I like to use this method: Cut each apple in half, then in quarters. Keeping the quartered piece on its side, cut away the core at a diagonal and slice into two smaller wedges. 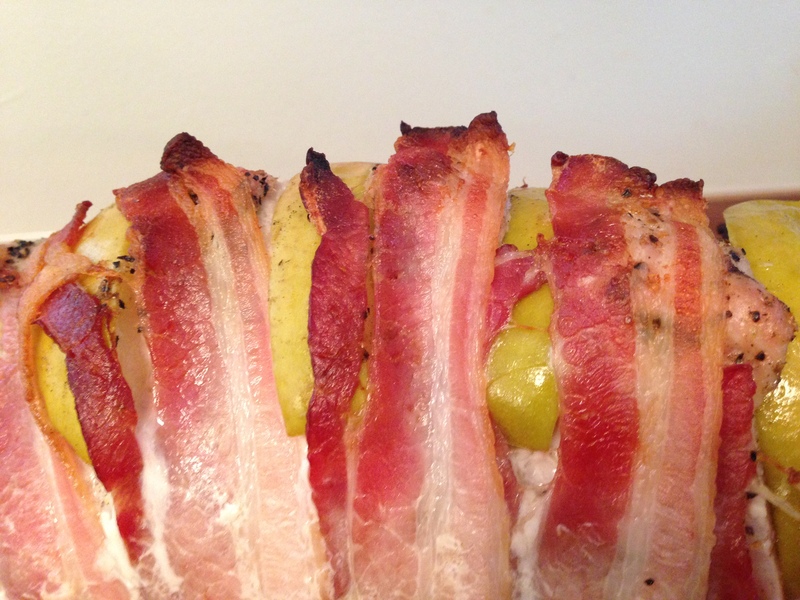 Cut 8-10 slits into the pork roast, going about ¾ of the way through the meat. 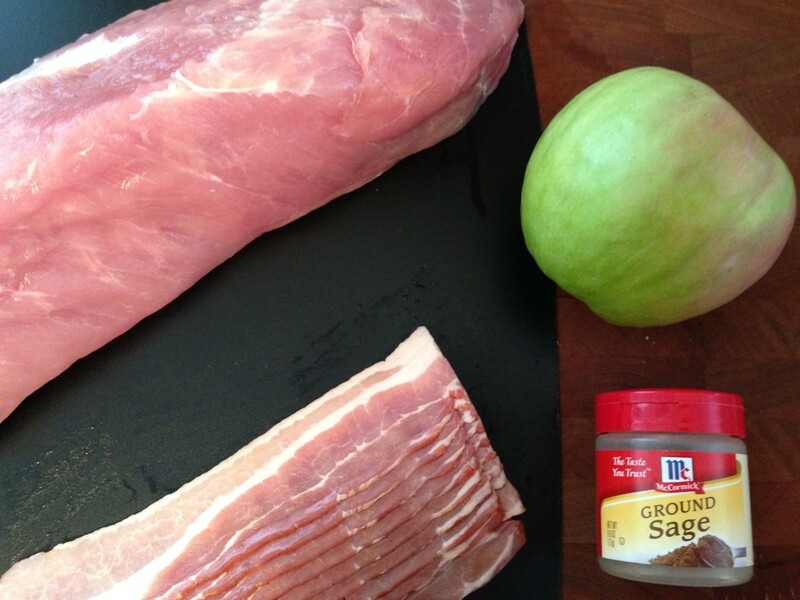 Insert the apple wedges into the pork roast, skin side up. Sprinkle the roast with salt, pepper and sage. 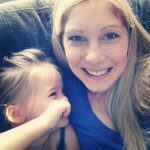 Rub 2 Tbsp. olive oil all over the roast. 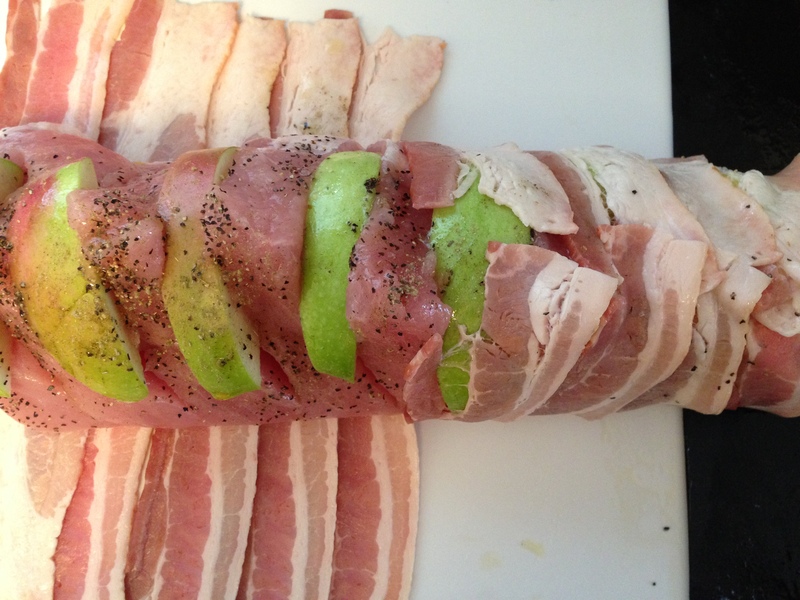 Lay out the bacon slices on a cutting board, slightly overlapping each piece. 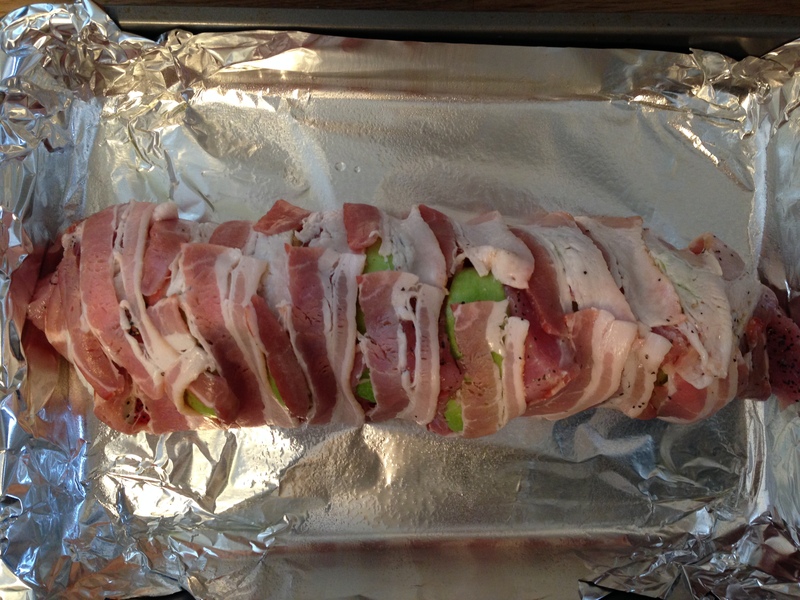 Lay the roast on top of the bacon and wrap the bacon around the top of the meat until it is completely covered. 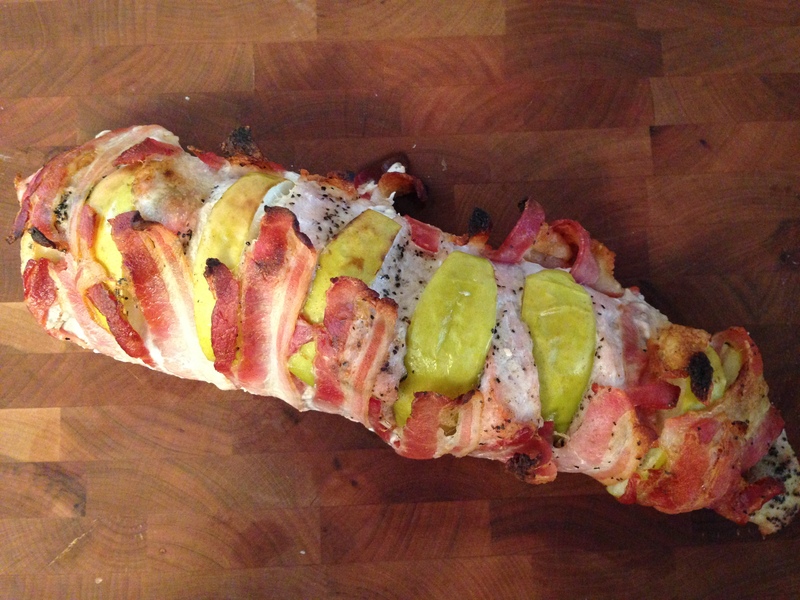 Roast the pork in a 400 degree oven for 30-40 minutes; then broil for 5 minutes to crisp up the bacon. If you are using a meat thermometer to check doneness, it should read 145 degrees (the standard used to be 160 degrees but the USDA recently lowered the recommended temperature). Let the meat rest on a cutting board for at least 10 minutes after taking it out of the oven – this is a very important step as it will allow the juices to redistribute and the roast will stay moist and tender. Slice the roast on a diagonal and serve on a platter.